With a core of talented veteran players returning to the field this fall and promising newcomers on the roster, the Knights set out to build on their solid 2016 season. The team launched into September with an 8-0 win over Bound Brook. Senior Amelia Kirby led the scoring, with two goals and two assists, followed by junior Hayley Goldin who notched two goals. The game was followed by a 1-0 loss to Mount Saint Mary, in which sophomore goalie Teresa Zimmer managed an impressive 17 saves. The team enjoyed strong defense throughout the season, with senior Ava Diggins, senior Amanda Lazar, sophomore Samantha Lowe, sophomore Anna Mikula and junior Catelyn Woelfle all playing very well in front of Zimmer. The Knights continued to tack on wins in September, beginning with a decisive 9-1 victory over Manville on September 12. 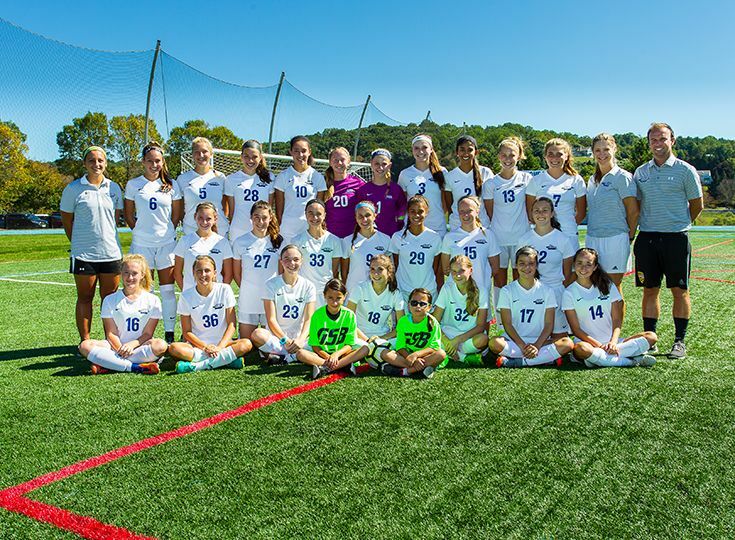 The game featured a hat trick from Goldin and showcased the depth of the team’s offense, with additional goals from sophomore Emily Raia (2), Diggins, Kirby and sophomores Ava Kolb and Alexandra Yates. On September 18, freshman Caroline Solondz notched her first goal for the Knights and also contributed an assist. Additional goals came from Kirby and Woelfle; Lazar posted an assist. On September 23, the Knights recorded another 8-0 win over Bound Brook in the preliminary round of the Somerset County tournament. Contributions came from throughout the roster, with two goals apiece from Diggins and Zimmer and individual goals from sophomore Courtney Hanks, Kirby, junior Eve Ryan, and Solondz. Senior Alexandria Delehanty contributed an assist. October brought a mix of wins and losses and saw increased contributions on offense from Lowe, who posted assists in several games. The Knights closed out October with a 4-1 win over Trinity Hall in the first round of the NJSIAA Non-Public B South sectional tournament. Yates recorded two goals and an assist; Kirby notched a goal and two assists; Goldin had one goal and one assist. In November, the team earned a 1-0 win over Holy Spirit in the NJSIAA sectional quarterfinals, courtesy of a first-half goal from Goldin off an assist from Kolb. The season ended with a loss in the semifinals to Moorestown Friends, bringing the Knights to 13-6-1 overall and 9-2-1 in their conference division. Stay tuned for more season wraps as well as coverage of post-season honors this week.